DOC reserve with a short walk to a trig. The walk begins from a well signposted carpark off the Forks-Okarito Road. Take the right-hand track beside the swampland area, which winds round and goes gently up the hill to a trig with good views over the Okarito lagoon. The swampland area is a good location for Fernbird. The 4WD track leading left from behind the carpark is a closed road and is for DOC staff looking after Okarito Brown Kiwi (the rarest of all NZ Kiwi species) that are resident in the area. 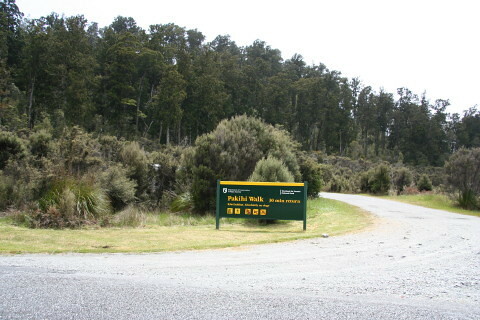 The carpark is signposted off Forks-Okarito Road about 5.5 km from the turnoff on the main highway to Franz Josef. Okarito township is a few km further down the road. As this is a Kiwi area, no dogs allowed.